Nickel finish escutcheon for the 1928-29 window winder handle. The round standard design escutcheon that goes between the upholstery and the window riser handle. 1-5/8" diameter. Correct for 1928-29 Coupe, Tudor sedan and pickup. Standard chrome Escutcheon for the 1928-29 window winder handle. The round standard design escutcheon that goes between the upholstery and the window riser handle. 1-5/8" diameter. This is the standard window winder handle for the Model A Ford. Mounts to a 3/8" square shank on regulator. Chrome. This is the scroll style window winder handle for the deluxe Model A Ford closed cars. Mounts on a 3/8" square shank. Chrome. Deluxe Escutcheon for the 1928-31. This is the fancy deluxe style escutcheon that goes between the upholstery and the window riser handle. Chrome. This is the window winder handle for the A-400, victoria, and Slant Windsheild 4-doors. Mounts on a 3/8" square shank. Chrome. 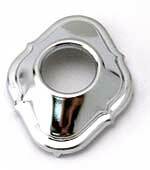 Replacement style that can be used in place of the A-48139-A or A-48139-B escutcheons. Used on the window winders. Brushed chrome finish. I.D. Is 11/16". Can be colapsed to a thickness of 15/32" or out as much as 5/8". Door Handle Pins for the inside door handles. 1/8" diam. 5/8" long. Set of 4. Made in USA. This one shaped spring goes behind the door upholstery panel, and keeps it tight against the escutcheons. Used behind window winder only. Fat end towards panel. Made in USA. When you roll the side windows all the way down, the glass channel sets down on this bumper that is mounted on a ledge inside the door. Made in USA. Used on the Model A Ford closed cars. When you roll your window down, this is the bracket that holds a rubber block (A-48141) for the glass channel to stop or rest on, rubber block is not included with the bracket. Made in U.S.A. Roll of door glass bedding 10ft. This is the black neoprene used for setting the glass in the side window metal channel. Coat with oil when installing, makes it slide in easier and will cause rubber to swell for a tight fit. The best model A window regulator on the market today! Functions like the original did, no more skips and jumps! 3 hole mounting style used in Coupes, Tudors and Pickups. Painted black finish. If you are sitting in the car, this is the right side regulator. If you are sitting in the car, this is the left side regulator. Four Door Sedan window regulator for the right front door, or left rear door. This is the 4-hole mount style used on the 4-door sedans. Four Door Sedan window regulator for the left front door, or right rear door. A set of countersunk screws with star washers to mount the regulator in the door. Does both sides for the Coupes, Tudors and Trucks. Made in USA. The small drive gear used on the double arm style window regualtors. Fits: 68C Cabriolet, 30-1 Victoria, A400 and S/W 4-doors. Made in USA. This is the shaft that the window crank handle mounts to. Used on the double arm style window regulator that was used on 68C Cabriolet, 30-1 Victoria, A-400 and S/W 4-doors. Made in USA. Regulator gear cup for the double arm style window regulators that were used on: 68C Cabriolet, 1930-31 Victoria, A400 and Slant Windsheild 4-doors. Made in USA. This is the main spring in the Model A Ford and american Ford V8 window regulator. Metal door glass channel for the 1928-31 Coupe, 1928-31 Tudor sedan and 1930-31 Trucks. This is the 25 inch long metal channel holding the bottom of the door glass. The regulator arm fits into the slot in the bottom. Right and left are the same. Metal door glass channel for the rear side windows on the Tudor sedan. This is the 29 inch long metal channel holding the bottom of the door glass. The regulator arm fits into the slot in the bottom. Right and left are the same. Door Glass Metal Channel for the Right Front or Left Rear. This slotted metal glass channel is used on all of the Ford made 4-doors and some of the other 4-door bodies. Door Glass Metal Channel for the Left Front or Right Rear. This slotted metal glass channel is used on all of the Ford made 4-doors and some of the other 4-door bodies. 1928-29 Closed Cab Trucks used this style of window channel. Made in USA. Also used on 1926-27 Model T Coupe and Tudor. Murray door glass channel for the Right Front or Left Rear. Fits the 1929-31 straight windshield 4-doors. 155-A, 155-C, 165-A and 165-C. A quality American made channel! Murray door glass channel for the Left Front or Right Rear. Fits the 1929-31 straight windshield 4-doors. 155-A, 155-C, 165-A and 165-C. A quality American made channel! This double arm style glass channel is used on the 1931 Slant windshield 4-door Model A. Also fits 1932 Four Door and 5 window coupe. 21 5/8" long. Fits right or left side. This double arm style glass channel is used on the 1931 Model A Victoria left side. Also fits 1932 tudor sedan and victoria left door. This double arm style glass channel is used on the 1931 Model A Victoria right side. Also fits 1932 tudor sedan and victoria right door. Rear window glass channel, for the roll down rear window, on the 1930-31 model A Coupe and the 1932-36 Ford V8 coupe. This is the steel support that runs vertically inside the door and has the ledge for the bumper that the glass channel sets on. Made in USA.